"A delicate Belleek porcelain posy or spill vase beautifully made, at the world famous County Fermanagh pottery works Ireland. 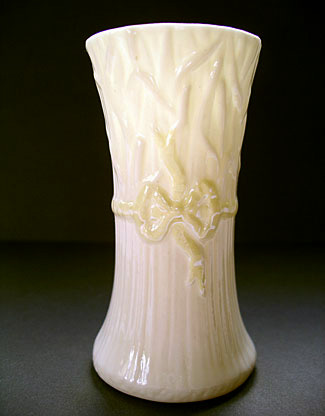 Another Belleek pottery original design - it is known as the Typha Spill vase. 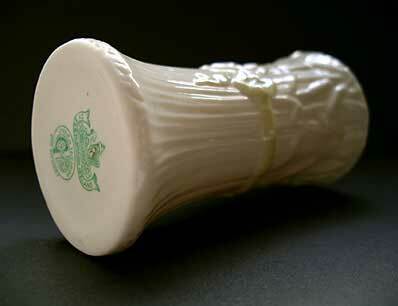 Note the subtle relief ribbon and bow decoration, beautifully enhanced with cob lustre. A lovely display example to add to for your best Belleek collection." Antiques Expert Hamilton Bear. Dimensions: height approx. 95 mm. Marks: First Green Mark as indicated dating 1945-55. Condition: A good display piece. 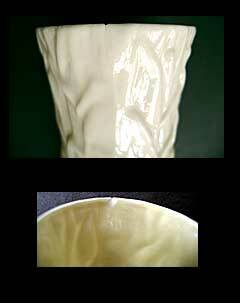 There is small rim chip with associated clean fine hairline to one side of the vase. This is quite difficult to spot and easily missed. The overall display qualities of the piece are still excellent to the main decorated faces of the vase.